If you asked me, “what is the one food you would bring to a desert island?” I would answer: Strawberries. 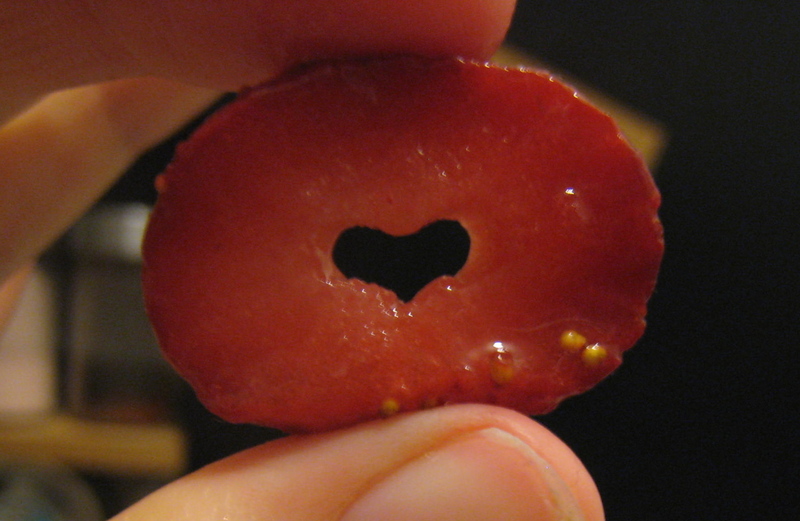 I love strawberries more than any other nourriture out there. Whenever I go grocery shopping, my fiancé will often lose me for a few minutes, only find me standing in the produce department, holding a container of berries, simply inhaling the glorious smell. When the fiancé and I started dating, I would visit his mom’s place and join them for dinner. She is an incredible cook, and always had a feast laid out that would make a king envious. After a few visits, she noticed I wasn’t eating very much. My fiancé finally cracked and told her that I don’t eat cheese, that I detest cheese. Being Italian-American, a good part of her meals were oozing with cheeses of all kinds. She had a whole shelf devoted to cheese alone in her fridge. So she asked him, “what does she like to eat?” He replied simply, “Strawberries.” And so the next time I visited, she handed me a great big, Costco-sized bowl of sliced strawberries, a fork and told me that I wont go hungry that night! She has kept it a tradition that every time I visit, she always makes sure to stock up on the strawberries. I think I won the MIL lottery! So this brings me to the pudding recipe. I was craving chocolate dipped strawberries, but had just finished off the fresh berries the night before. I have frozen strawberries stocked in the freezer always, but those don’t exactly make the best ‘dipping’ strawberries… I had tried making chia pudding before, with limited success, and thought I would give it another go. Blending the chia seeds sped up the gelling process by over double for me, and it also solved the ‘texture’ issue I had with the whole seeds. This was rich and delicious, and just as satisfying as a chocolate dipped strawberry. I saved the last bit for the morning, and had it over a bowl of oatmeal, for an incredibly decadent breakfast! 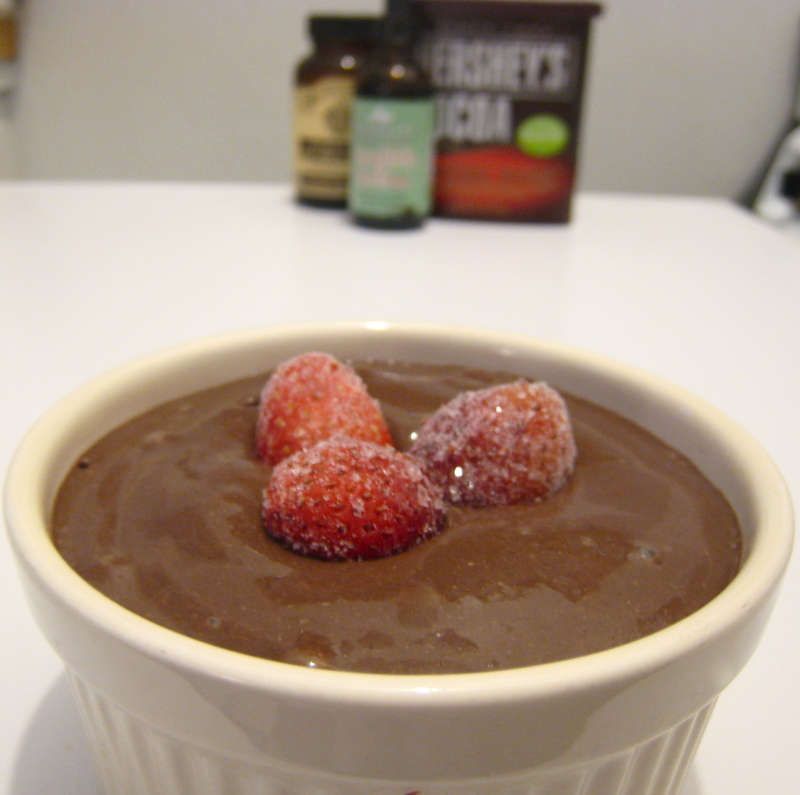 Place all ingredients except berries into a blender. Blend on high for about 30 seconds. Scrape down sides so that all the chia seeds have a chance to absorb liquid. Let sit for about 30 minutes, pulsing at least once to break up any clumps. 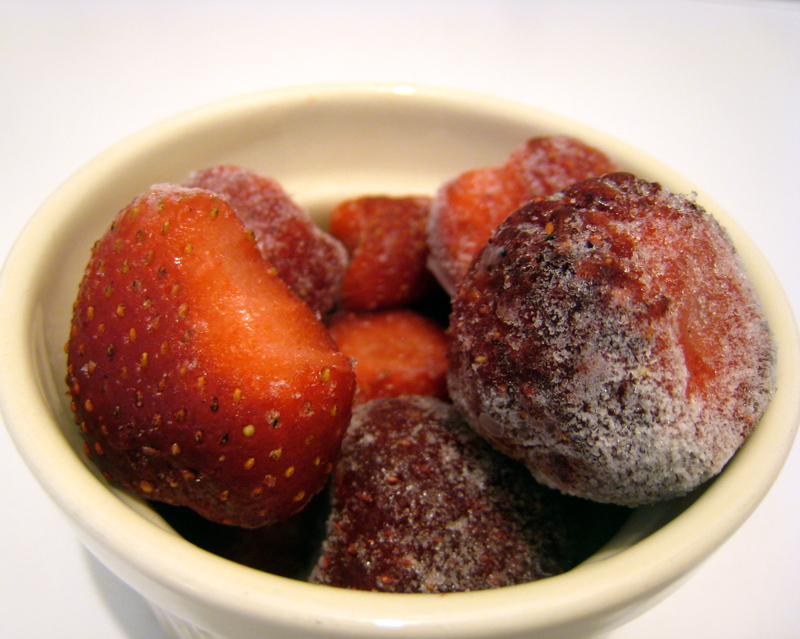 After the chia has thickened, add frozen fruit and blend on high until smooth. Serves 3, 1/2 cup servings. I am so glad I learned to cook in the age of the internet. I have tried so many new and interesting recipes, using ingredients and combinations that I never would have tried if I was just picking out cookbooks. There is something appealing about getting a first-hand review of a recipe, rather than speculating whether the meal will actually be good or not. I don’t know about you, but I have had my fare share of cookbooks where I swear the recipe was never tested. There was actually a cookbook that was so bad, after about 5 flops I was convinced I was a terrible cook. That thing went to goodwill, but it may have done more good in the trash! I stumbled upon this recipe on Lemongrove Avenue, and I was immediately intrigued. Kale is a relatively new ingredient for me, and I’m always excited to try using it in new ways. Plus, add coconut to anything and I’m down with it. The original recipe called for 1/3 cup olive oil, which I just couldn’t stomach. Too much oil always makes me feel drowsy headache-y. I was able to cut it down to 2 tablespoons, which means I shaved off about 350 calories! The whole meal is extremely easy, and only took me about 30 minutes. Plus it was absolutely delicious, and is going on my “must make again” list. Roughly shred the kale. 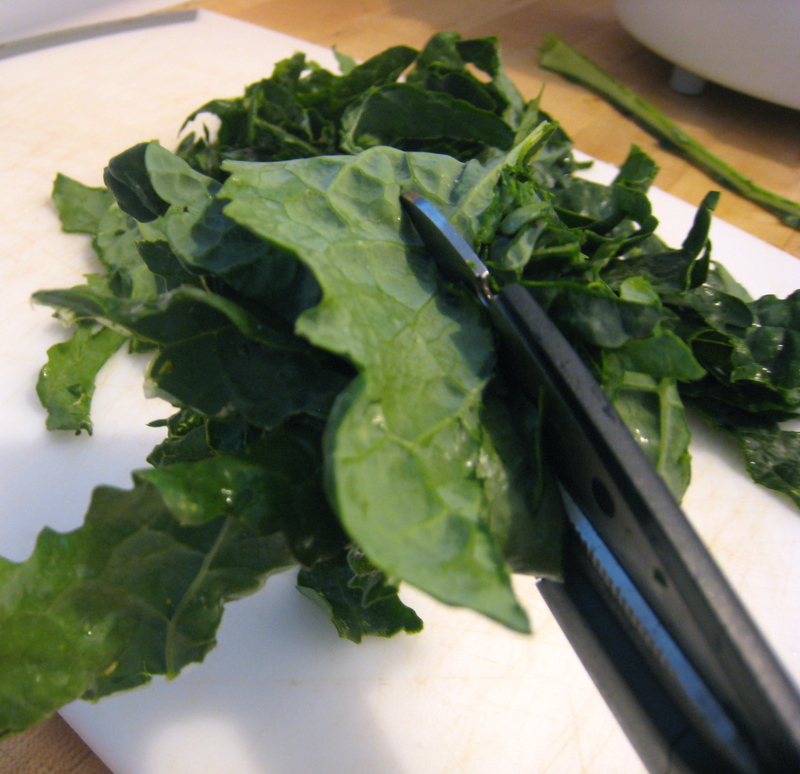 I usually tear the leaves off the stems, roll them into a cigar and cut with my kitchen scissors. Mix the olive oil, sesame oil and soy sauce well. Pour a little more than half of the sauce over the kale and coconut and toss well. 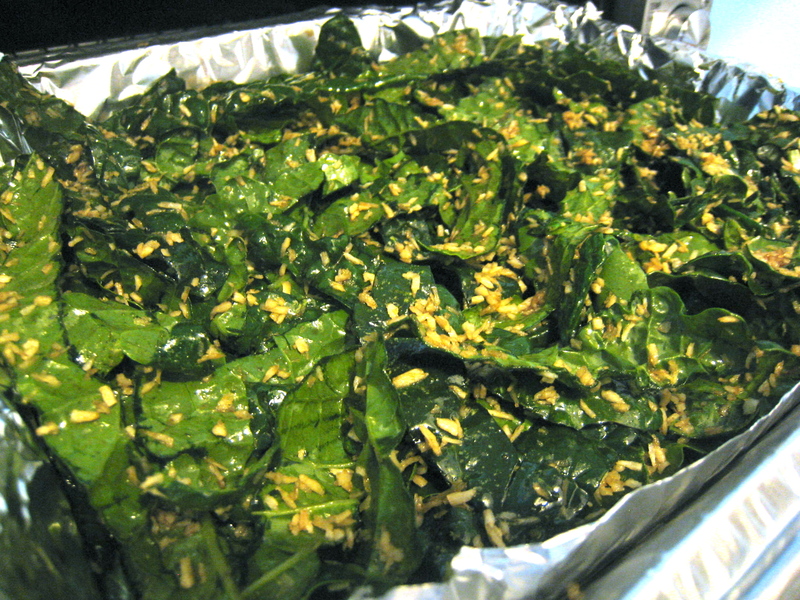 Bake kale and coconut for 15-20 minutes, until crispy. 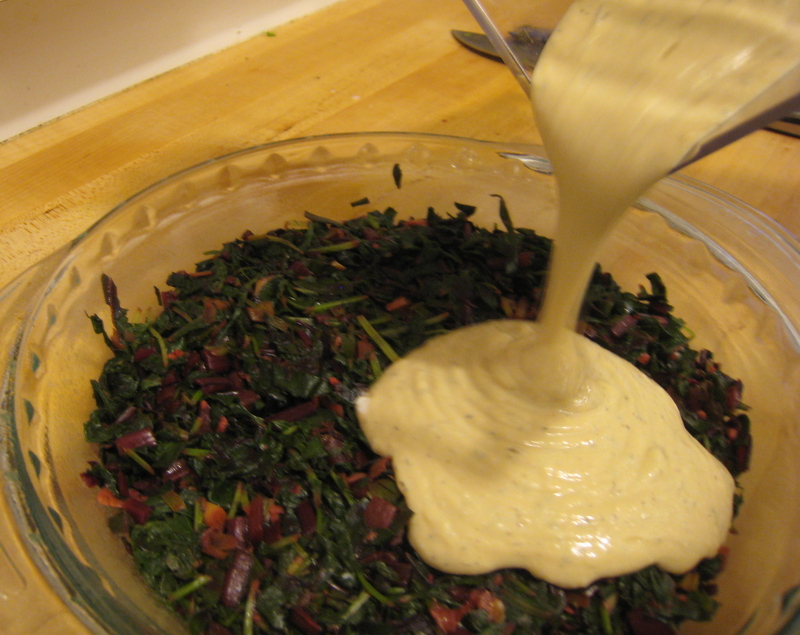 While the kale is cooking, pour the rest of the sauce into a blender. Add tofu, ginger, pepper and water and blend well. 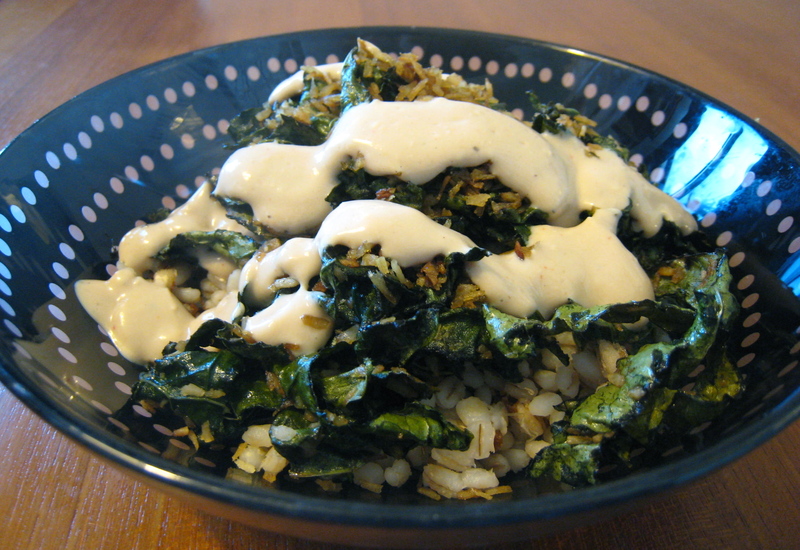 Once the kale has become crispy, serve over grains and top with the sesame soy dressing. Enjoy! Mix the olive oil, sesame oil and soy sauce into a small jar or bowl. Shake well or whisk to combine. Pour a little over half of the sauce onto the kale and coconut. Toss well to combine, and spread evenly in a large pan. Cook kale mixture for 15-20 minutes until crispy, stirring occasionally. 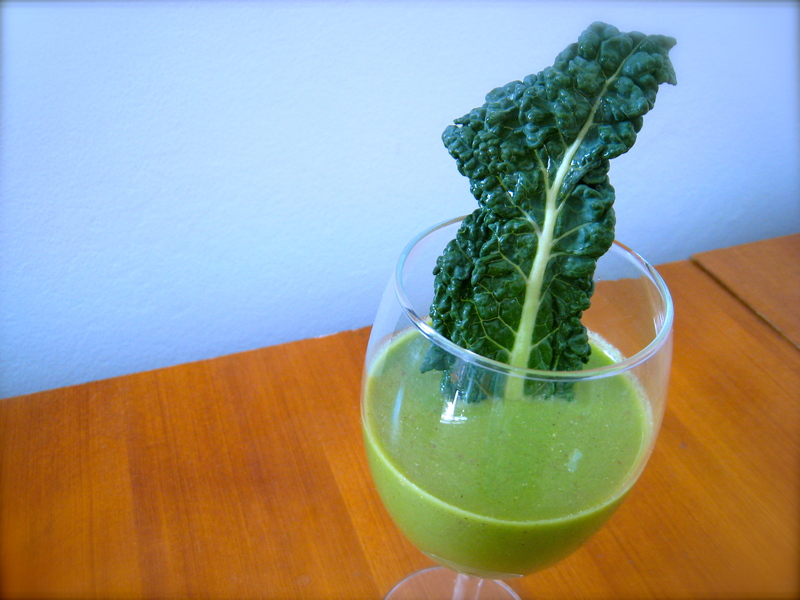 While kale is cooking, pour remaining sauce into blender. Add tofu, ginger, cayenne, pepper and water. Blend until smooth. When kale is finished cooking, place over grains. Drizzle about 2 Tbs tofu sauce over bowl. Hummus is one of my go-to dishes when attending or holding a get-together. It’s incredibly easy, and yet people are endlessly amazed and impressed by it. People seem to think it is difficult to make, and until I tried making it, I did too! 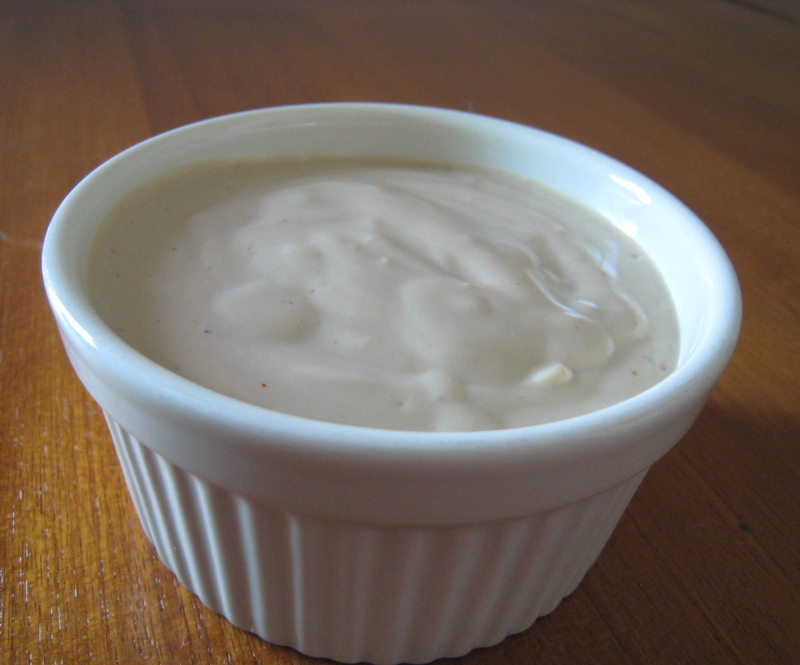 Now, I think I make hummus on nearly a weekly basis, using it as a healthy snack, sandwich spread or salad topping. I make it a little different each time, so I never get bored. Today, I was craving something lighter and sweeter than my usual spicy garlic variety. I remembered this carrot hummus from Fat Free Vegan, and decided to give carrots a try. 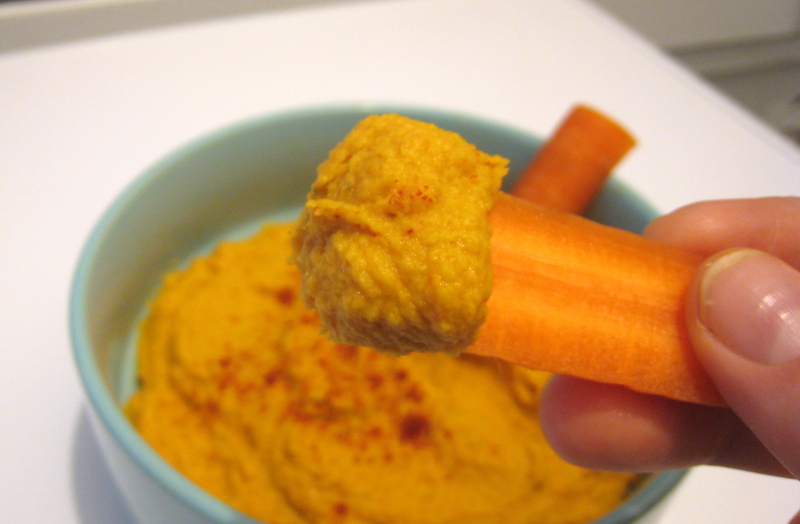 I love dipping raw carrots in my hummus, so I figured roasted ones would be even better. And it was! 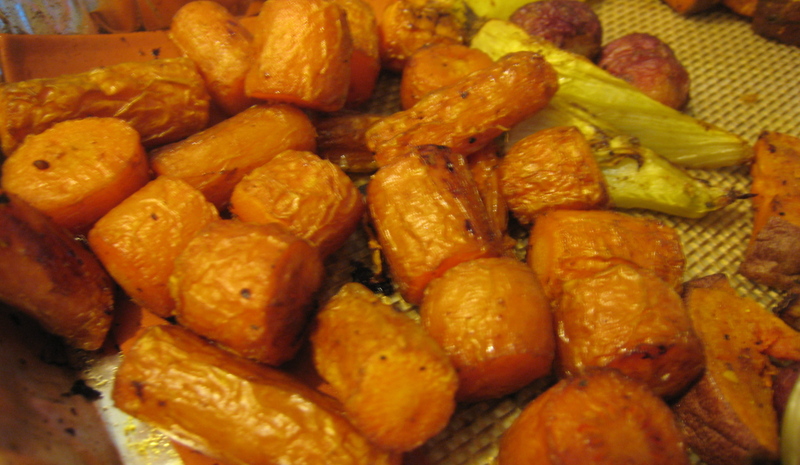 The sweetness that the carrots gave just begged for a smokey counterpart, so I added some smoked paprika . I roasted the carrots along with some other leftover vegetables, and I ate the veggies while I prepared the hummus. After the hummus was finished, I snacked on it with the remaining carrots. Best lunch ever! Chop the carrots into 2 inch chunks. Spread evenly in non-stick pan, and lightly coat with oil. Roast for 50 minutes, or until tender. After 25 minutes, coat peeled garlic cloves in oil, wrap in tinfoil (make a little package) and place with carrots. Optionally, leave raw for a spicier hummus. 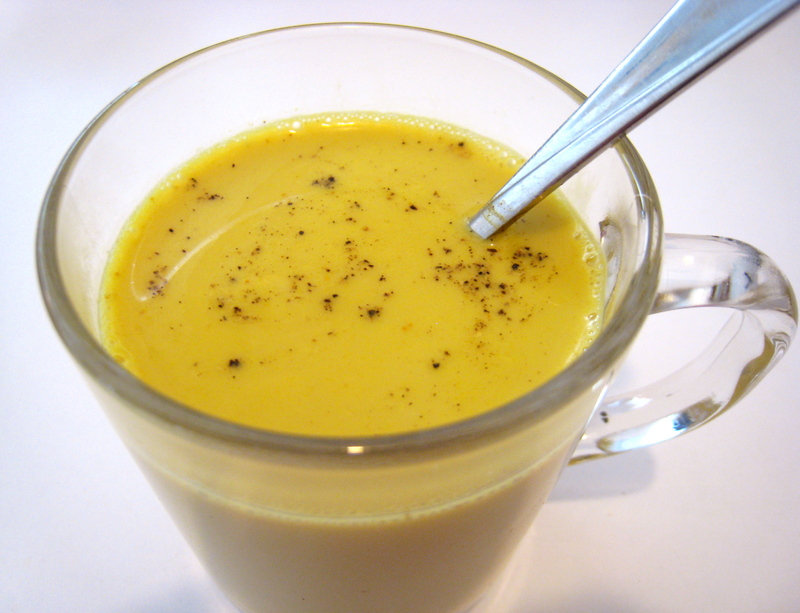 Combine garbanzo beans and the rest of the ingredients in a blender or food processor. Blend until smooth, adding water as needed. 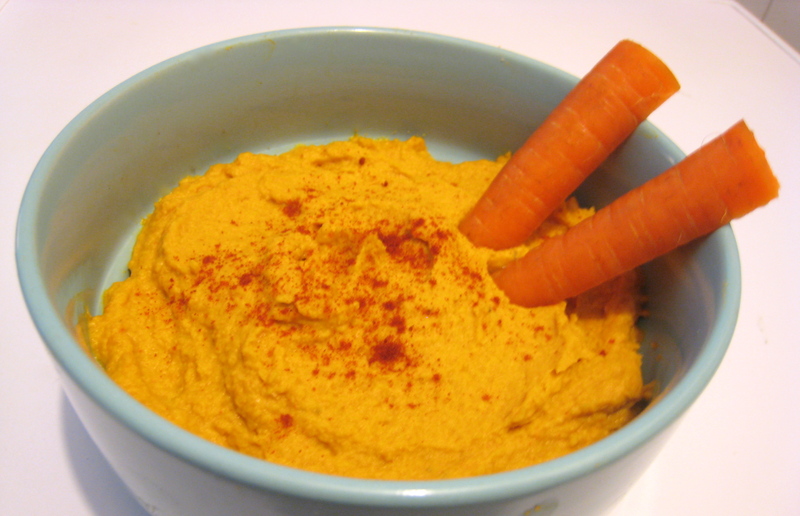 After carrots and garlic have finished roasting and cooled slightly, add to hummus and blend well. Ok. This stuff is delicious. Like eat-it-straight-out-of-the-jar-with-a-spoon delicious. After making the crispy apple chips, I dipped a few in peanut butter and it was gooooood. So I figured, why not mix the the two and make magic! You can make this two ways, crunchy or… chewy (for lack of a better description). The chewy version, using apple rings packs a bit more apple-y punch, but the crunchy is my favorite. I’m a big texture person, and I love the crispy crunch that the apple chips give it. 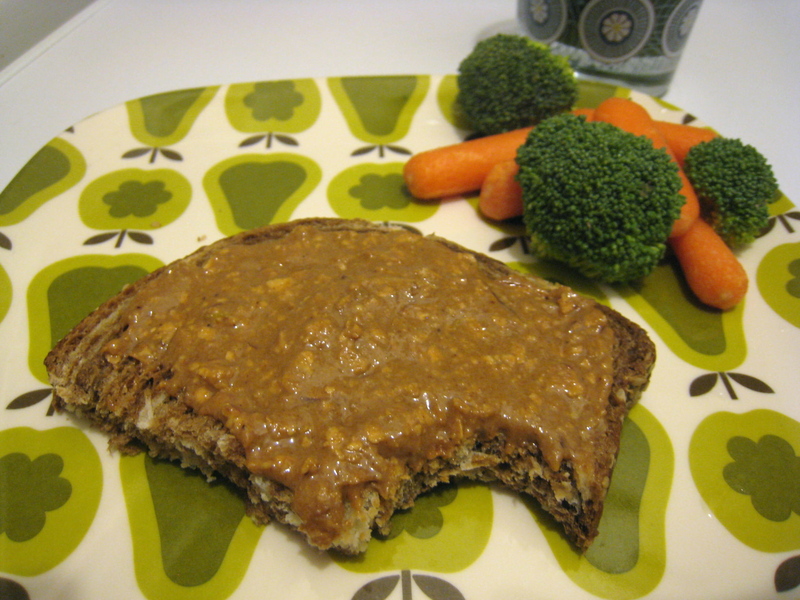 If using pre-made peanut butter, mix all ingredients together and enjoy! 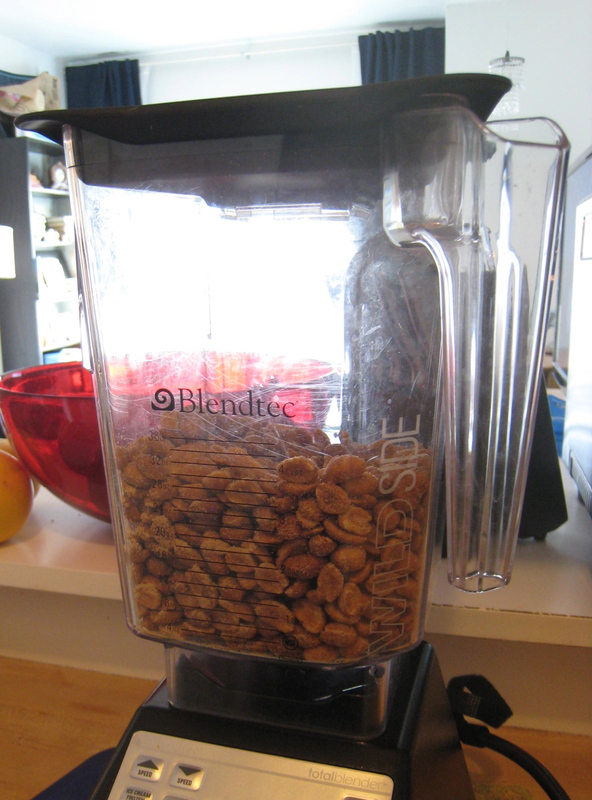 My favorite things about my Blendtec so far has been that it is SO easy to make nut butters. In about 5 minutes I can turn a pound of peanuts into a pound of gold creamy peanut butter! 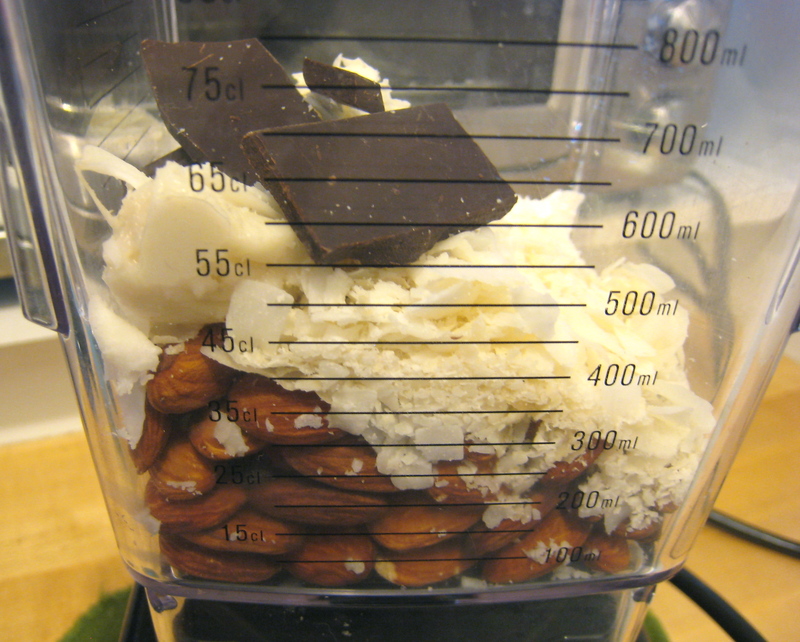 This can also be accomplished with another high-speed blender such as the Vitamix, or a food processor. 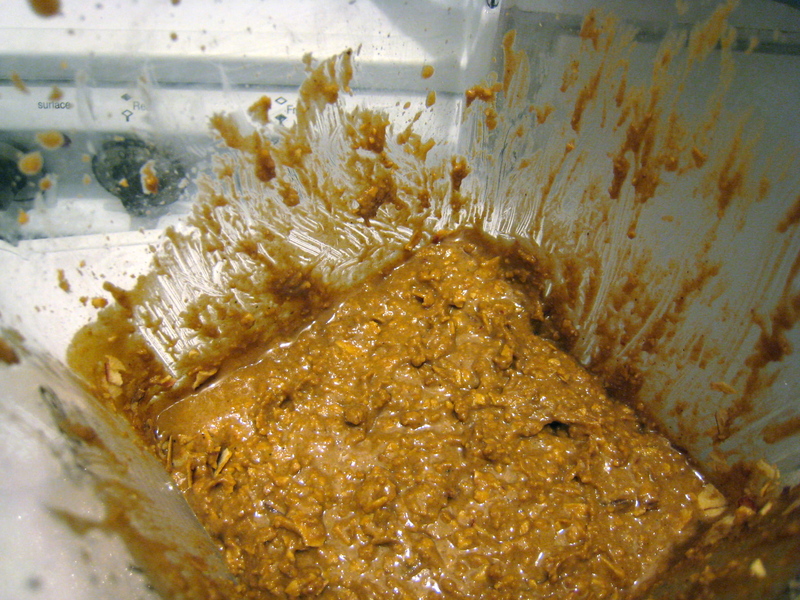 I’ve even heard of people using a masticating juicer to make nut butters! 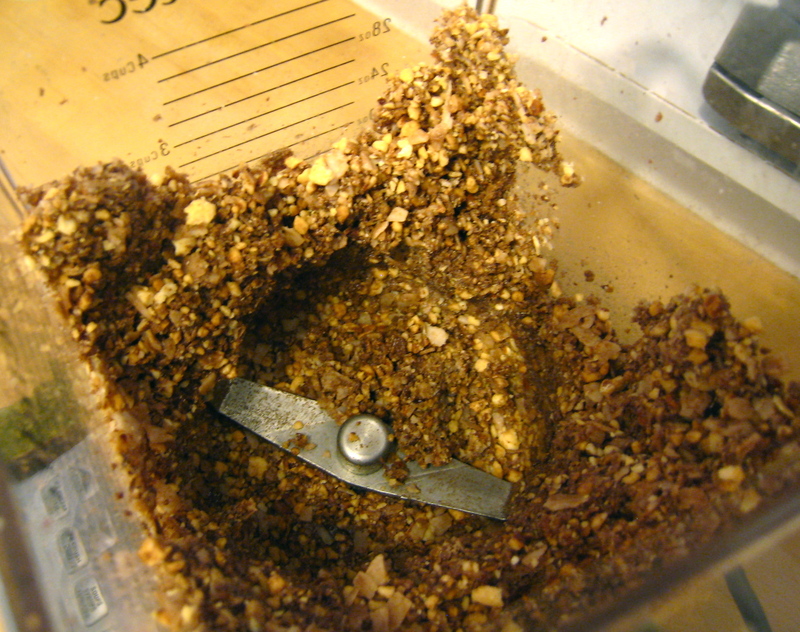 Blend on medium-low until the nuts have moved up onto the sides of the container. Stop the blender and pack the chopped nuts down tightly. Blend on medium to high, stopping occasionally to scape down the sides. Once the peanut butter begins to warm up, it will be easier to blend, and I usually blend on high to get it creamy. You can stop before this if you want a chunkier texture. When your peanut butter is the texture you want, add crushed apple chips to the butter. 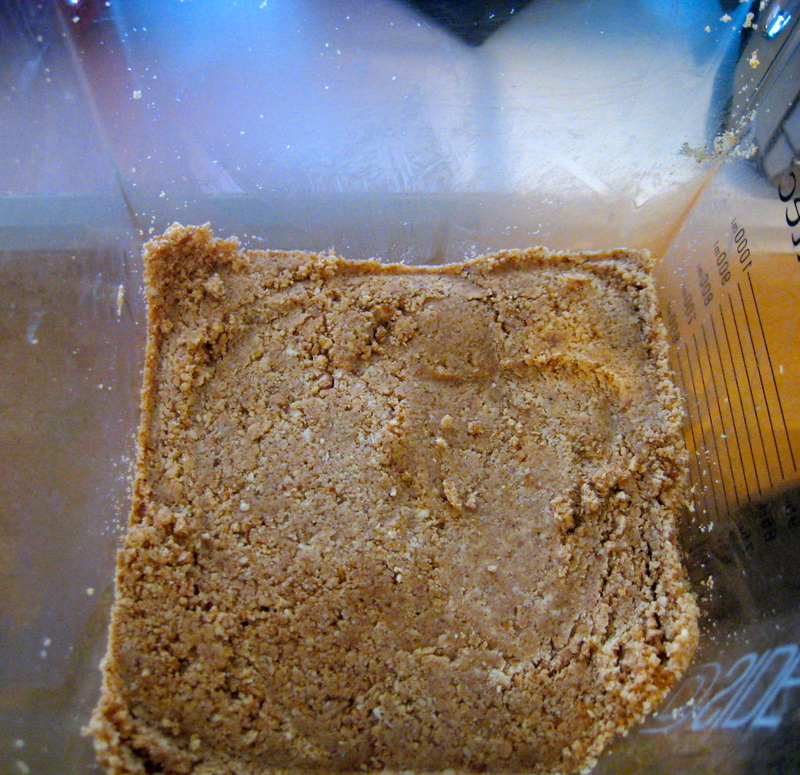 Pulse a few times to get it mixed in, but do not over mix or you will lose the crunchy texture. Maybe not the most appetizing photo? Spread onto warm toast and enjoy! 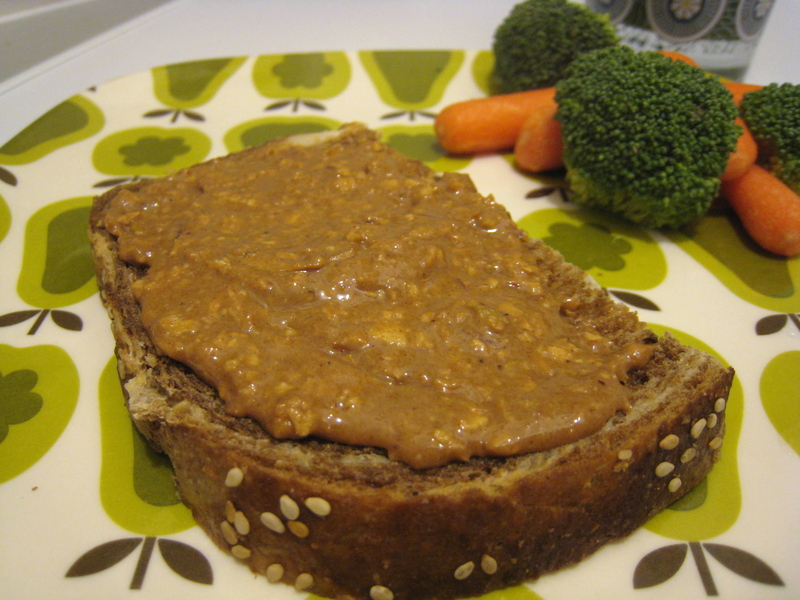 Ever since getting my beloved Blendtec, I have been making nut butters like crazy. 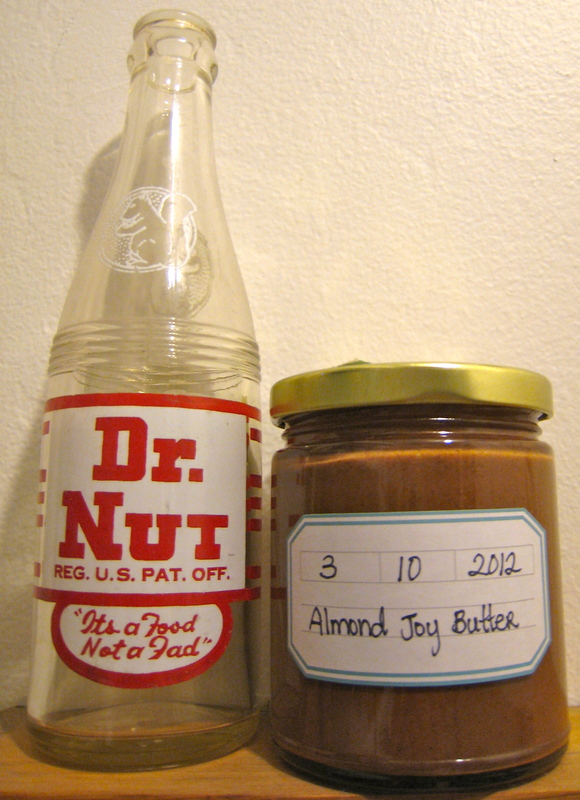 It’s just so gratifying to be able to pour in a pound of peanuts, and five minutes later have rich, creamy peanut butter. 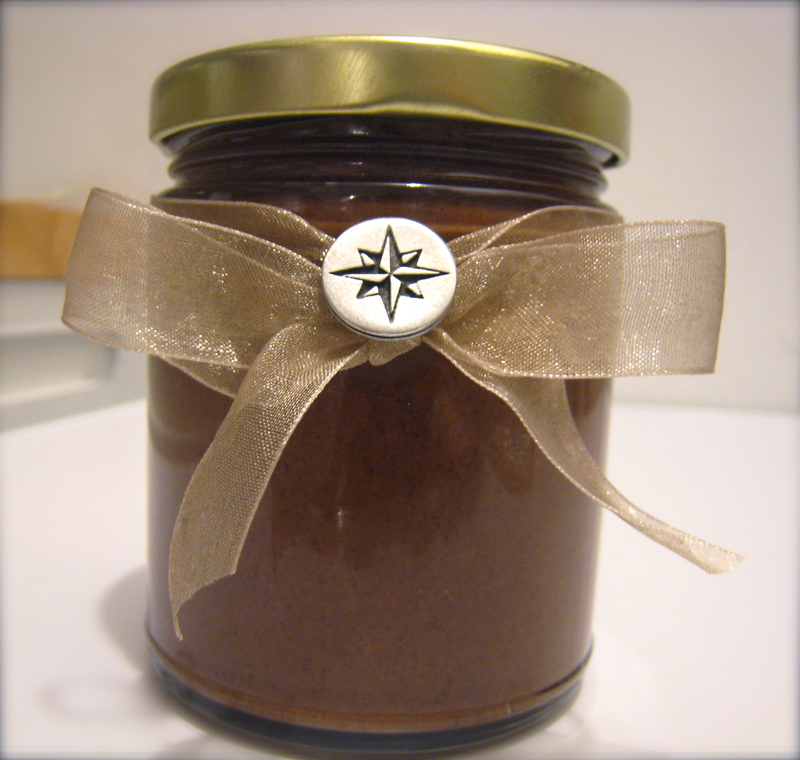 I think we’ve been going though about a jar a week, eek! Then we *gasp* ran out of peanuts. How would I survive without my peanut butter and banana sandwich?!? Luckily I found a bag of unsweetened coconut in the back of my fridge, and a new love was born. 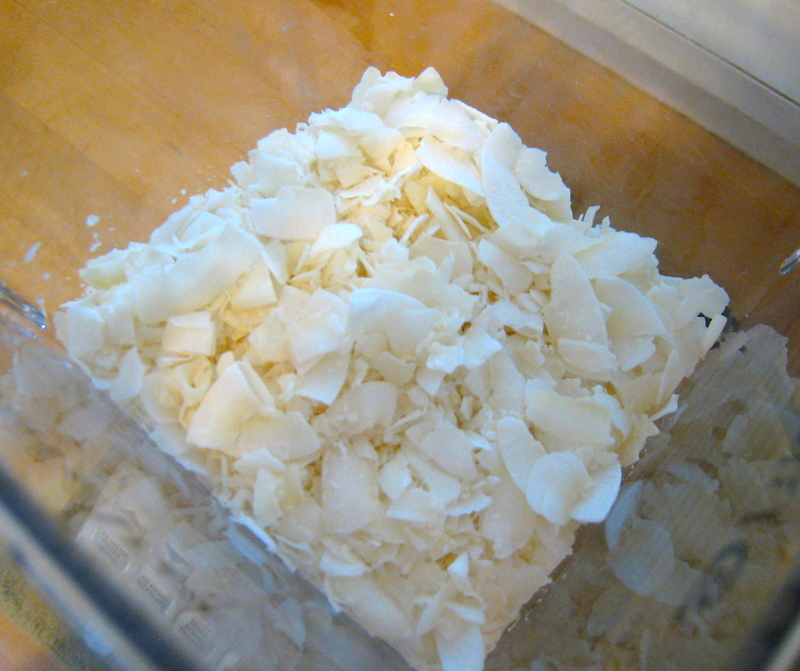 Place about 4 cups of coconut flakes or 3 cups shredded coconut in your blender or food processor. Begin blending on low speed, scraping the sides as you go. At first, the coconut will start to look more like coconut flour. As you keep blending, the oils will warm and the coconut will start to stick together. If this isn’t happened, you may need to add some coconut oil to facilitate the process. Continue to scrape the sides, and increase the speed as you go. 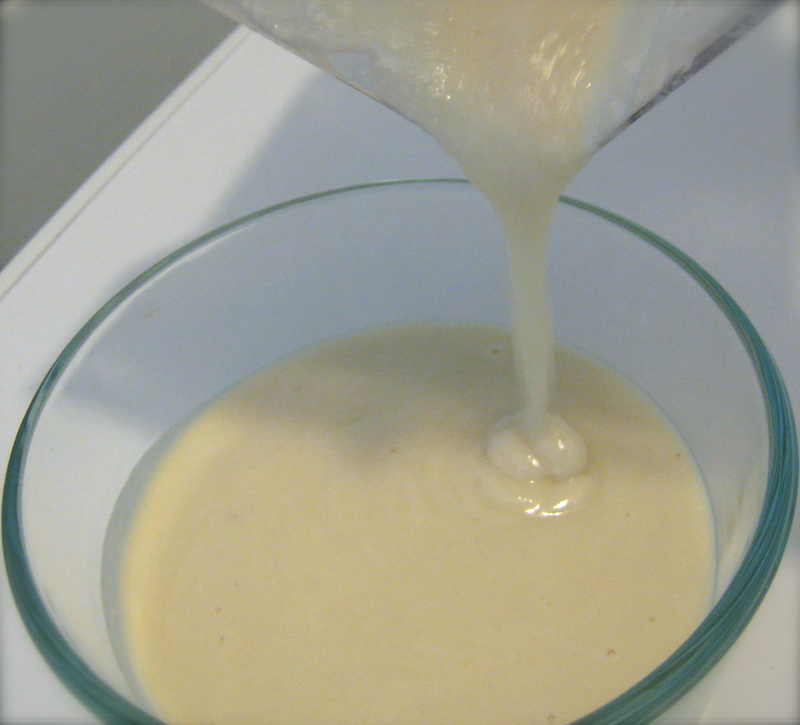 After about 10-15 minutes of blending, the coconut butter should be extremely runny. 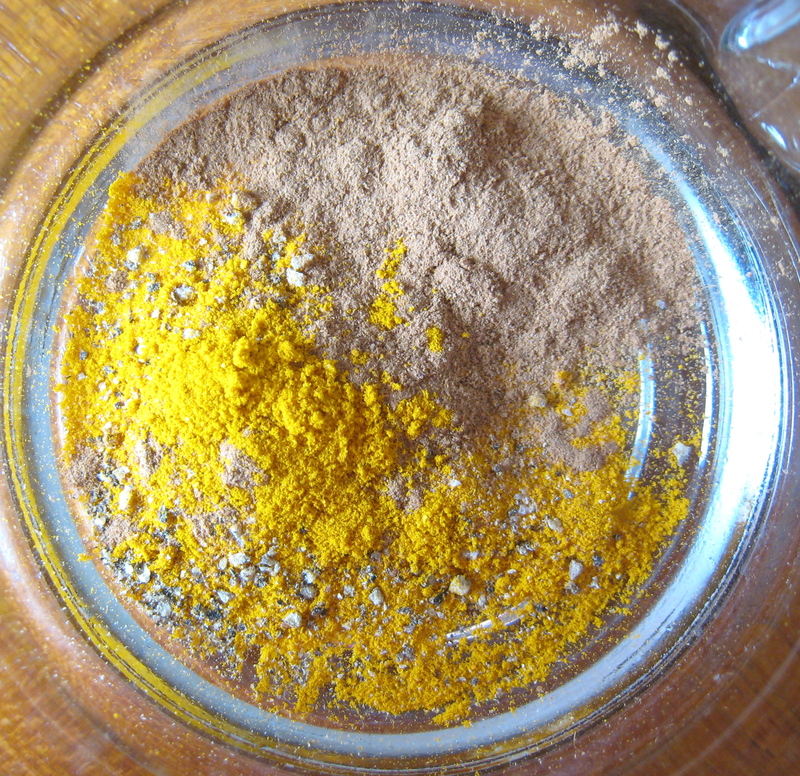 Pour into a glass container and store at room temperature. The coconut butter will solidify as it cools down to room temperature. 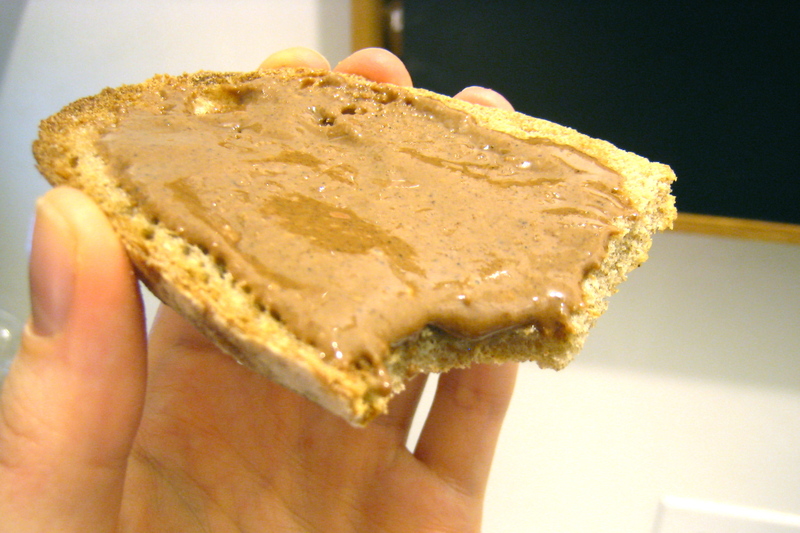 If you keep your place chilly, you may need to warm it up a bit to make it spreadable. So what do I use coconut butter on? So far I’ve made coconut butter and banana sandwiches, melted or massaged it into kale salads, made a ‘fudge’ and added it to smoothies. Poor Mr. Peanut Butter hasn’t seen any action all week. Ha! As I mentioned earlier, I have had a hard time getting into the green smoothie craze. I love all the ingredients, but I have a hard time enjoying ‘thick’ food. I also have had trouble with getting strange headaches right after drinking them, like I’m having a sugar rush. This weekend I decided to try an experiment. I made a green smoothie on Saturday, and on Sunday I made a meal using the very same ingredients. Here is my comparison. For the meal, I chopped up the fruit, and tossed it with the lemon juice. I used the coconut butter and made a massaged kale salad, and sprinkled the flax seeds on top. The smoothie wins hands down. With my trusty Blendtec, I barely had to chop the fruit. I just threw everything in the container, pressed the smoothie button and presto! smoothie done. The meal took about 15 minutes to make, with all the chopping and massaging. Due to my ‘thick food’ aversion, it’s pretty easy to guess that I enjoyed the meal more. The fruit salad was of course delicious, and the massaged kale salad was better than expected, but not something I’d ever crave. 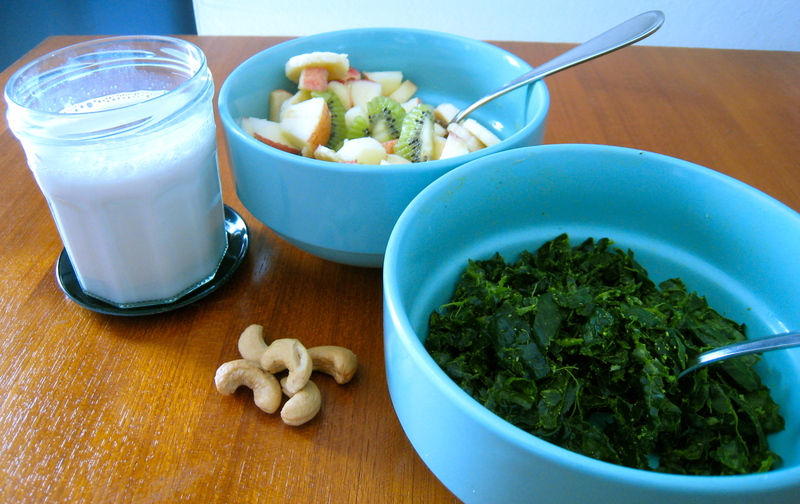 The almond milk was enjoyable as usual, and I really relished munching on the cashews. The smoothie on the other hand, was pretty much right down the middle of the two in flavor. Don’t get me wrong, it was very good, just not fruit salad good. I drank the first half of my smoothie rather quickly, and it was very filling. I first felt heavy and full, then the usual light headed feeling and slight headache kicked in. However, I sipped the second half slowly, and the feeling quickly dissipated. I wasn’t hungry, but I did have the nagging desire to chew on something, out of sheer habit. The meal took longer to eat than the smoothie, so didn’t have any trouble with a “sugar rush”. It’s definitely something that I could eat on a daily basis, it I had time. I was able to wait for my next meal, just the same as with the smoothie. I think I still prefer to have a meal for breakfast, but the smoothie was pretty good. You can’t beat the ease and speed of the prep! As long as I drink the smoothie really slowly, I think I can prevent the ‘weird’ feeling. In the mornings during the week, I barely have time to brush my hair, let alone massage some kale. I think I may have to same a meal like this for the weekends. The smoothie, I might give another chance. The key is, make it fast, drink it slowly! I love flax seeds. Those little itty bitty seeds are so packed with nutrition and flavor. They are rich in B vitamins, magnesium, manganese, and are loaded with fiber. But most of all, they are rich in Omega-3 Fatty Acids. Omega-3 Fatty Acids are anti-inflammatory, and can’t be synthesized in the human body, so it’s important that you consume them as part of your diet. While the best way to maximize the nutrition of flax seeds is raw and ground, there is more to life than just nutrition, right? 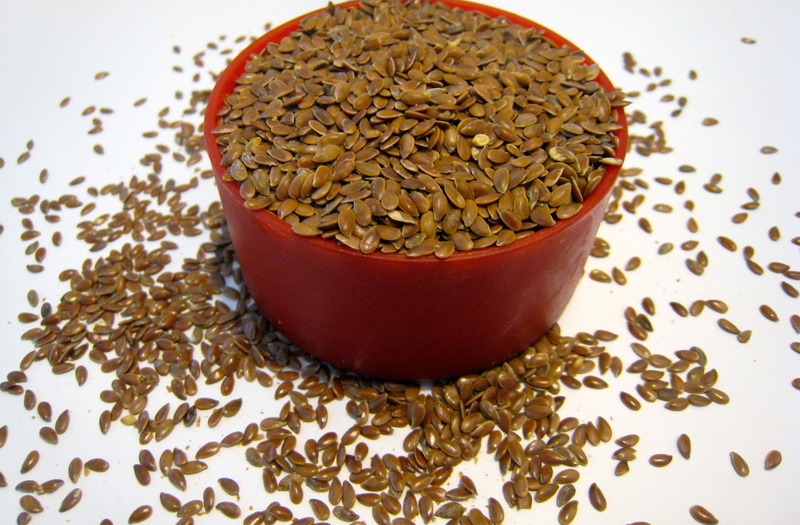 Toasted (or roasted) flax seeds are incredibly flavorful, like a cross between sunflower seeds and pumpkin seeds. It takes just a few minutes to toast the seeds, and you can use these crunchy delights in an infinite amount of ways. Sprinkle them on yogurt, oatmeal, peanut butter toast, ice cream, hummus, the list goes on. I even may have started to eat them by the spoonful… Just maybe. Heat up a non-stick pan on medium heat. 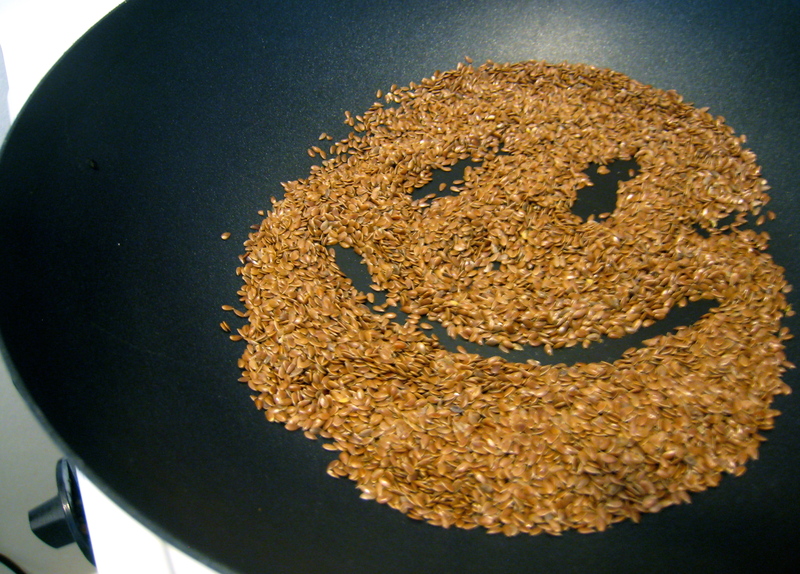 Once hot, pour flax seeds into dry pan. Stir seeds continuously for 3-5 minutes. 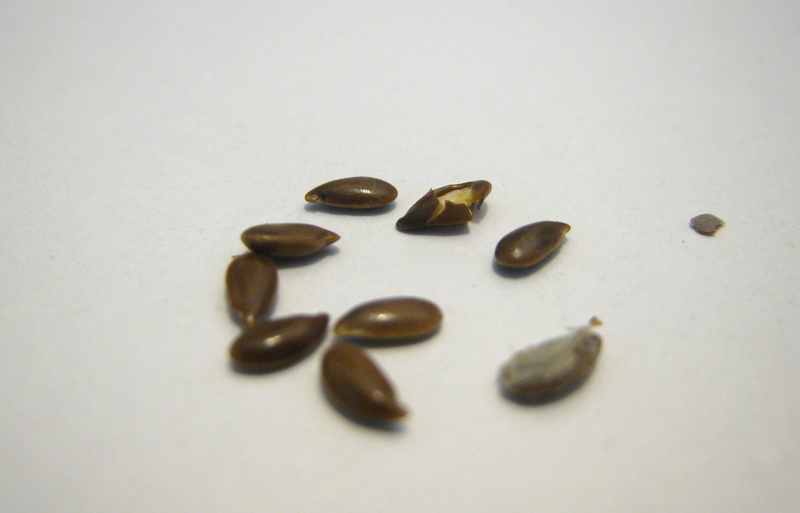 Seeds will begin to crackle and pop, much like popcorn. Continue stirring until seeds are fragrant. Remove from heat and pour into a heat-safe dish. Stir seeds as they cool down. Enjoy! I’m still whittling away at the giant bag of greens I got this weekend, making something new each night. I’ve been trying to eat the greens from most perishable to least, and so far, nothing has gone to waste (but it’s a bit early to start patting myself on the back just yet!). It’s been a delicious adventure, trying all these new flavors. Today’s greens are beet greens. 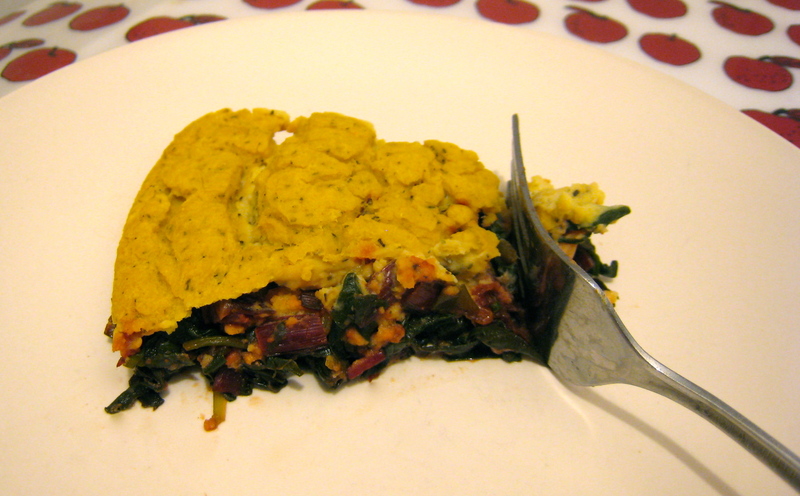 These are quite similar to swiss chard in both texture and flavor, so I decided to turn to one of my favorite easy recipes: Fat Free Vegan’s Savory Swiss Chard Pie. However, I was lacking both half of the tofu and the onion. In the spirit of using what you have, I decided to sub a can of cannellini beans (white kidney beans) for half the tofu, and it worked beautifully! The beans made it taste even more savory, and added a buttery richness that just the tofu lacked. Tofu is just a processed bean anyways, so why not! This technique is now my go-to for using up leftover tofu, since I think it’ll work in nearly any proportion (and I always have a can of beans around). I love the ruby red color contrasting that bright green! The ever difficult "self pouring snapshot"
The top of the pie did shrink and crackle more than when I’ve made it with tofu only, but it looked quite neat. 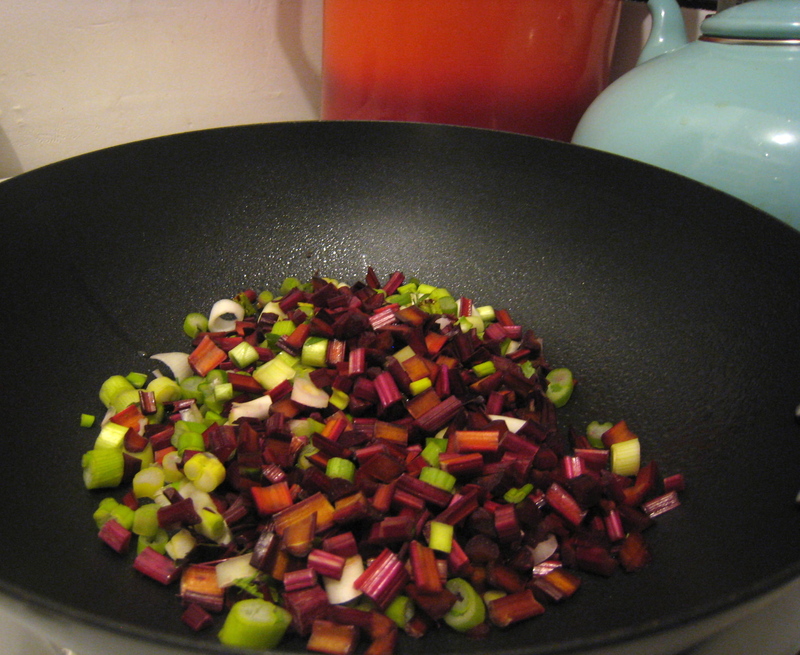 Chop the white base of the green onions and the stalks of the beet greens. Saute the stalks and onions on medium heat until soft, about 5 minutes. Chop the beet green leaves and the tops of the green onions into bite sized pieces. Add garlic and the leaves to pan, stir well and cover. Let cook until mostly wilted, about 3 minutes. Remove lid and let the excess water cook off while leave continue to cook. Meanwhile, add the rest of the ingredients to a blender. Blend until smooth. 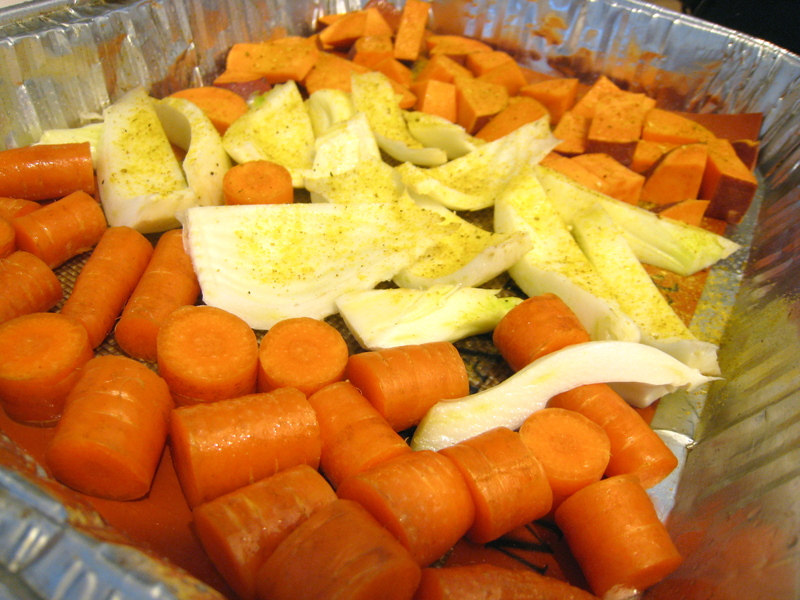 Evenly spread the cooked veggies into a pie pan sprayed with oil. Pour the tofu-bean mixture over the veggies. 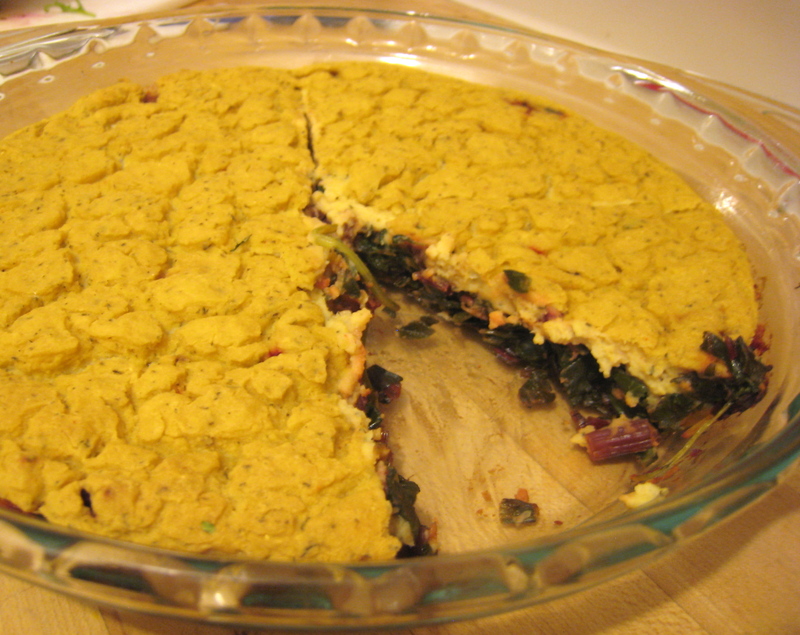 Using a spatula or fork, gently push the tofu mixture down though the veggies, so that it is incorporated, but not mixed. Bake for 30 minutes, then let cool for 5-10 minutes before cutting.